In his remarks, Marinakis stated that he will support Moralis and the “Piraeus Victorious” ticket with all his forces, so that they may continue their work in the city. 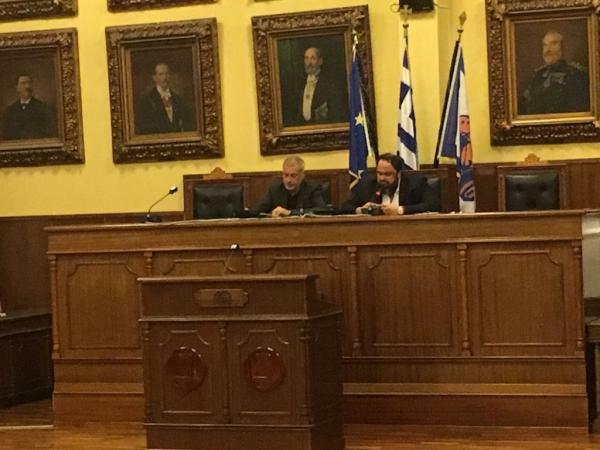 Piraeus Mayor Yannis Moralis and Vangelis Marinakis, the City Councilor who garnered the most votes in the last municipal election, shared their vision of a strong, winning Piraeus at a festive gathering of the “Piraeus Victorious” ticket, on which Moralis will seek re-election in May, 2019. The ticket is launching a major battle to win City Hall once again, in order to continue the work it began four years ago. The sole aim is to make Greece’s biggest port city a contemporary, viable city with a municipality that helps the economically weak, prioritises athletics and culture, and completes the city remodeling projects that have already changed the face of Piraeus. Moralis and Marinakis underlined that the raison d’etre of the ticket is to express a selfless love of the city and the will to bring a renaissance to Piraeus, worthy of its history. “I put in motion all these actions in order to contribute in practice to the work of the municipality, without any personal gain or quid pro quo, without having any business transaction with the municipality, motivated only by my love for Piraeus. Despite the scenarios peddled by some, I am not pursuing any additional activity in Greece and Piraeus. It is self-evident that in the future I shall continue to do the same for our ticket, which I view as my own creation. I still want a modern and different Piraeus, a victorious Piraeus,” Marinakis said. For his part, Moralis thanked Vangelis Marinakis for his support all these years and underlined that the efforts will continue “to make a Piraeus with prospects and dynamism at all levels”. “We have done much and we must do more. We have a duty to continue at a rapid pace the effort we began in 2014 – to make Piraeus a dynamic city with bright prospects,” said the Mayor of Piraeus. “Four years ago, people with different starting points but a common vision for Piraeus decided to create this ticket, with the prospect of doing things for the city we love. Much of what we announced in 2014 has been implemented, often with huge difficulties. Other things for bureaucratic or governmental reasons have not yet started. I attempted to help the municipality with all my might and at all levels – to improve the urban environment by creating green spaces, by building and remodeling squares, athletics facilities, playgrounds, and with cultural events that left a strong mark. We daily support the charitable efforts of KODEP (Piraeus’ municipal charitable enterprise), and the Orthodox Metropolis of Piraeus, which we assist in all its efforts. I initiated all these activities to contribute palpably to the work of the municipal authority without expecting anything in return or in exchange, and without having any business or transaction with the municipality. My only motive was my love for Piraeus. Despite the scenarios cultivated by some, I do not seek any additional (business) activity in Greece or Piraeus. Obviously, I shall continue to do the same in the future for our ticket, which is also my creation. I still want a modern and different Piraeus, a victorious Piraeus, and I believe we will win the bet of creating a Piraeus that is worthy of its history, capabilities, and residents. We will certainly respect any opponent, but we will once again be true with faith in our principles, our programme, and our work. We know how to conduct a campaign. We all live in the same city and have nothing to divide between us. Hence, I shall back with all my forces the “Piraeus Victorious” ticket. I will be with you on the road to making our city as we dreamt of it, with the big projects that we have completed and advanced. We are waging a major, new battle for Piraeus, and I am convinced we shall again emerge victorious,” Marinakis said. “It is a special joy to have us all here today, together with Mr. Marinakis, who was elected City Councilor with the largest number of votes of all candidates on our ticket, the man who supports the Municipality of Piraeus like no other all these years. The effort that we all launched together four years ago has produced results. We committed ourselves to create the preconditions for changing Piraeus for the better. That commitment was met. From the start of out term, we worked with a plan. We managed to hammer out the biggest development plan in the history of Piraeus, securing over 111mn euros in EU funding. We solved chronic problems such as the remodeling Mikrolimano (a small, graphic port) and the exploitation of the Pyrgos (tower), projects that are in process. We are moving forward with important remodeling works, projects, and interventions all over Piraeus. We are struggling every day in the face of significant difficulties, which often transcend the limits of the municipality, in order to improve the daily life of our citizens, at this crucial juncture for our city and country. At the same time, we are supporting those in lower income brackets with a series of social actions. We are putting emphasis on helping our senior citizens by upgrading Love and Solidarity Centres, and we are supporting the disabled, and all those who truly need our support. In addition, we made culture and athletics a priority for our city, and Piraeus came to the forefront.